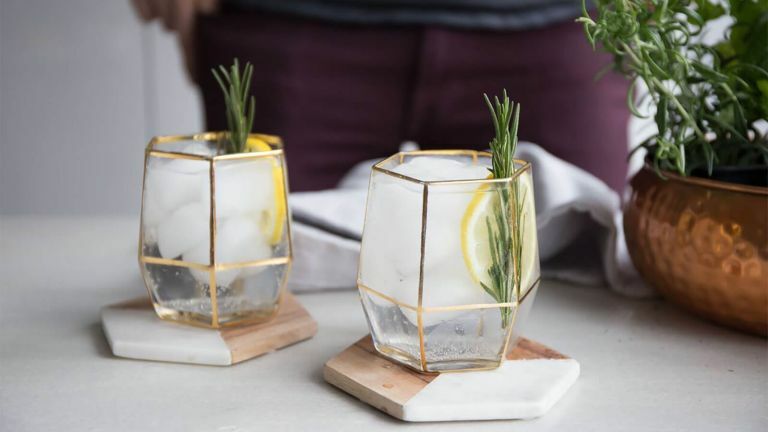 A good set of tumblers, along with the likes of your wine glasses, is a glassware staple, and the great thing about tumblers is that they are the most versatile of glasses. Whether it’s a glass of orange juice with breakfast or a cheeky whiskey before bedtime, a strong, sturdy and stylish tumbler is the best way to drink it. And guess what? Tumblers make for a perfect Christmas gift, particularly if you're on a budget. When you've finished reading, why not have a look at more Christmas gifts under £25? We’ve picked out a range of tumblers, from individual quirky ones that make a great gift for someone, to basic sets for everyday use, and luxury sets for special occasions. John Lewis offer some unique and classic designs from brands such as Anthropologie that never go out of style, whereas Made is the place to look right now for the latest modern trends. Adding a pop of colour to your dinner table, these vivid blue tumblers both look good and provide a sturdy vessel for your drink of choice. We recommend not putting them in the dishwasher if you want to keep them intact, but handwashing will keep them bursting with colour and free from chipping so you can expect them to become a staple in your glassware collection. These hand-blown glass tumblers with gold detailing lend themselves to Art Deco styling, and wouldn’t be out of place in the hands of guests at a Gatsby party. There’s only two in a set, so you may want to keep these for special occasions, or if not, they’ll certainly bring a touch of luxury to your daily dining. They’re hand-blown glass, so understandably very delicate, make sure you hand wash these to keep them looking their best. This large set of six tumblers come in all different colours so the next time you’re at the dinner table there’s no risk of picking up the wrong glass. They have a weighted bottom so you can expect them to feel nice to hold and durable enough to chuck in the dishwasher to avoid masses of cleaning once the party’s over. If you like everything to match, then you might find these confetti style tumblers are right for you. They come with matching glassware items to complete a cocktail set so you can show off your mixing skills at your next dinner party. These are pretty enough to want to keep these on display, or their slim design means they won’t take up too much space in your cupboard. Matching sets not your thing? Then this set of four different tumblers is a great way to distinguish whose is whose at the dining table. Each one has a different pattern and they come gift boxed if you wanted to give them as a present. Unlike many of the other tumblers on the list, these ones are dishwasher safe, too, so they’re really easy to maintain. Copper is very trendy right now, so if you or someone you know likes to keep up with the latest designs these tumblers could make a nice little gift. They come nicely presented in a box and they’re hand-crafted from mouth-blown glass so you can expect each one to be slightly unique. They’re also dishwasher safe which is a bonus! The cocktails are sorted, but what about coffee? Treat your morning (or afternoon, or evening) joe to a new home with our best coffee mugs.